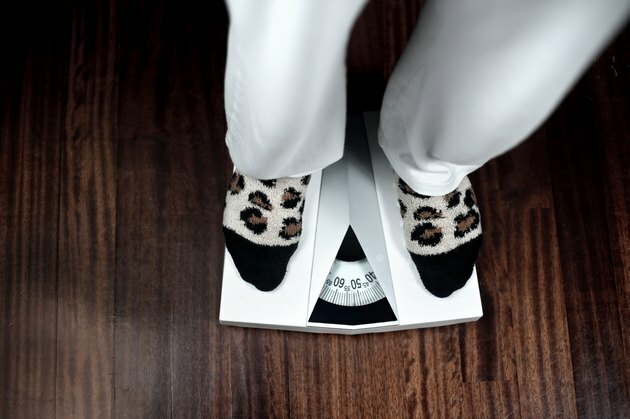 Rapid weight gain is normal in girls during puberty, according to the KidsHealth.org website. Puberty typically begins between ages eight and 13, and lasts about two to four years. During this time, the amount of fat, muscle and bone changes quickly as girls make the transition into womanhood. Failure to gain weight during adolescence is actually unhealthy, according to Children's Youth and Women's Health Service, or CYWHS. Major bodily changes take place in girls during puberty; the final major growth spurt in life occurs during this period. Puberty actually begins when the brain instructs the ovaries to make the female hormone estrogen. This hormone and others cause a girl's body to grow in size and change in shape as it prepares for procreation -- or having a baby. Gaining 15 lbs. or more during puberty is considered normal and necessary for proper growth and development. As a girl develops, her body will make more fat to allow for fuller thighs, stomach and breasts, and wider hips. Lean body mass in girls diminishes from approximately 80 percent to 75 percent by the end of puberty, while the amount of body fat increases, according to the University of Southern California Keck School of Medicine. In comparison, the percentage of lean muscle mass in boys increases from about 80 percent to 90 percent by the time they reach adulthood. Some girls may feel awkward if they become curvier sooner than their friends and classmates. However it's unhealthy to attempt to prevent normal pubertal weight gain, cautions CYWHS. Eating healthy foods that include lean meats, fish, whole grains, fruits and vegetables while limiting fast food and other junk foods like cookies, pastries and chips can help prevent unnecessary weight gain during puberty. Regular exercise can also help keep girls from becoming overweight or obese. Participating in sports and other forms of exercise can boost self -esteem and improve body image. Help your daughter understand that weight gain is a inevitable -- and healthy -- part of her development. Talk to your health care provider if you feel your daughter is gaining too much weight during puberty. He can suggest an appropriate weight-loss regime if necessary. Avoid fad diets or rapid weight-loss plans during adolescence, because they can retard growth and sexual development. KidsHealth.org: What is the Right Weight for My Height? Is Weight Gain Normal During Puberty?